I read “time travel” and “Romanov Russia” in this novel’s synopsis and thought this book must have been written for me…because let me tell you, I have quite the fascination with the last ruling royal family of Imperial Russia. A revolution, an assassination, an escaped princess whose body was never found? That is the stuff of my childself’s imagination. (Also, this is one of my favorite movies of all time — judge me.) In fact, I’ve immersed myself so much that I can recite the particular characteristics of each sister, so finding out that Gray centers on my personal favorite grand duchess just blew me out of the water. 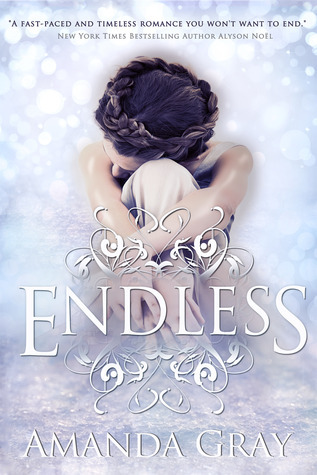 That is where it ends, however, because Endless is an occasionally effective mystery book, an at-best adequate suspense story and a sometimes cheese-inducing romance novel. I can’t say that this novel is driven by its characters because I think they are quite lackluster. Jenny is an only child, she lives with her dad and has an aunt and one friend. She is lonely and always looking for someone to understand her. She’s sad when she needs to be sad, smiles when she has to and fights when she’s called to. There isn’t anything remarkable or memorable in the way she is presented except for the fact that she has a special ability. The problem here is that a reader cannot just be told a character is a certain type, this must be supported by the environment; how people react to this character, etc. The development was simply lacking. And I felt this practice was current in most aspects of the story. For example, a lot of weight is placed on a relationship we never even truly witness. Yet this relationship is central not only to understanding Jenny’s emotional state but to the plot itself. In fact, Jenny’s relationships to those closest to her are showcased very minimally. Apart from Jenny, the secondary characters all seemed one dimensional. They wavered transparently without ever taking solid shape. Something else I had a problem with was dialogue. Endless dialogue (excuse the pun). Everyday, mundane conversations are not necessary. When having a phone conversation about a crucial clue to the mystery the characters are solving, we don’t need the chit chat. I am (most of the time) a firm believer of less is more. Too many words, too much description tends to devalue the work, in my opinion. The point is, a lot of this is skimmable. Now the plot. About half-way through the book, I suffered a jerking bout of confusion…because initially, what with Jenny’s ability to see visions and dream strange dreams, Endless seemed to follow the route of a paranormal. Enter time travel. After that, it seemed more sci-fi. Not that the two are exclusive but it was strange to start a character off by defining them by a single magical talent, then not using that talent for the rest of the book. The plot progression is also, at times, equally confusing. The subplots are obviously interconnected but it isn’t done in a way that makes it easy to identify the connecting threads, nor is it engagingly ambiguous. (Though much of this might be me being not-smart). And when at last all the dots are connected, a lot of it still didn’t make sense. And, as far as I know, this is a stand alone. No room for later explanations. Why, you wonder, did I give it 3 stars. Well, Gray really hit me with the Romanov family. And also, this is very readable. I point out my issues because I wanted it to work. And it does. I can see how many will have a good time with Endless. Unfortunately, it could have been more. One more thing: I did kind of love the ending. Such a tease. Romanov Russia is a time period I really love reading about too, K. Unfortunately this one sounds like it might take me a lot longer to read this than I want so I’ll probably skip this one. I am curious about that ending though! Ha, you have me curious about this ending now. I actually haven’t read many reviews for this, and I don’t think I ever really knew what it was about until now. The premise sounds intriguing, but it’s a shame that the execution fell flat for you in one too many places. Too much dialogue can bother me too, in the same way that an overabundance in description can. I prefer for these things to be appropriately balanced. Still, I’m glad to hear that Endless was readable at least. Great review, K! Exactly, Sam. It’s the most disappointing thing — when you’re given a promise but its not what you thought it’d be. Most disappointing of all was that Gray picked my favourite Romanov daughter, haha! Excess of dialogue and description are just annoying. What that does is make think “geeze, this character never shuts up” and it just ruins the mood for the rest of the book. How disappointing! I’m with you, I thought, “Ooh Romanov Russia and time travel? MY KIND OF BOOK!” And it has a gorgeous cover, but from all that you reviewed, I would probably grow to really dislike it. Bleh. Sorry you didn’t enjoy it, but that she was spot on with the Romanovs. Great review! Hmm, not sure if I’m going to like this plot. The story has appeal but if the plot is slow and fails to hold me then I feel….well you know. Thanks for the review. The plot isn’t exactly slow…it was simply lacking, especially when you read the synopsis and your curiosity is piqued. It doesn’t deliver as a reader might hope. What a bummer. I am really into Romanov stuff, too, and I get very upset when people mess it up. Because it seems like the easiest thing to do well, right? Also: a bit of trivia about me is that I won several talent shows the year that movie came out singing the song from it. Oh ho! We might make you sing it for us sometime, Kate! Ah! You must send me a recording or put it up on youtube, Kate! I’m fascinated by them and was disappointed how weak the Romanov element in this actually was. If you’re looking for accuracy, stay away! I think it might actually piss you off. Yeah, chit chat when we need to get moving on with the plot and mystery…not so great. Sounds like the potential’s there but it just doesn’t quite come together. Darn it all. Haha, Mary. It was a struggle because I kept thinking, why are you talking about how work went when you should be talking about the stuff you discovered about that mystery thing you found in that creepy place. Such a shame you couldn’t love this book more, K. The cover is beautiful and the idea of time travel to me is exciting. I’ll be adding this to my considering pile, maybe I’ll pick it up some day.. maybe not, we’ll see (: great review! That’s a good idea for a pile and I encourage you to put this book there! It isn’t a must-read but like I said, I can see how it could be popular with a lot of readers. It gives a lot of what readers respond too. Unfortunately, I’m an obnoxious and pretentious reader and require through explanations and details for me to accept. Hee hee! Oh my Keertana. If you’re sensitive to how time travel is depicted and explained and hypothesized then this might ruffle your curious feathers because it’s vague and wishy washy. Yeah, this one was a “miss” for me. I gave it 2.5, I think? It was enjoyable enough but I just *did not* understand the connection between Jenny and Nikolai at all. I felt like he had no personality beyond “basic decent human.” I actually liked Ben a lot more which is odd since there wasn’t much to him either. And how weird to think Jenny has this cool power and it’s hardly ever even used or mentioned. So strange. I also really didn’t understand how using fingerless gloves got her around the problem of making contact with people…uh, so her power is only in her palms? What? Was I missing something? Am I being dumb? Gah, it bothered me. That cover sure is beautiful, though. Oh Kim, I could’ve gone on and on about Jenny and Nikolai and their insta-love. It was just not convincing at all. Nikolai was boring like plain bread and all he did was ask if anyone had hurt her. SIGH. And yes, I absolutely wanted her to pick Ben. And about Jenny’s power — which makes almost no appearance. It doesn’t come in handy, we don’t know why it happens…that’s what I meant when I said how even with the “explanations” in the end, it still didn’t make sense. So much is missing still. So much. “Dancing bears, painted wings, things I almost remember…” I ADORE that song, and I adore you for loving that movie as well. Russia + time travel seems like a great setting for a book, but it’s a shame that the book seems to be lacking in several different important areas. I was eyeing this one, so thanks for guinea pigging it–seems like I’m probably safe in skipping it. I love that song, too, Wendy. A lot of the writing technique, character and world building could have been strengthened for sure. I don’t think you waste too much energy if you do read it, I don’t think you waste too much enjoyable reading time if you miss it. T’was okay. I understand you, I love stories like that as well, so fascinating! I’m sorry that some points didn’t work out. But I confess I’m curious I didn’t know it was about this topic. Time travel, you mean? Or Romanov history? There isn’t too much of either actually but considering everything else, they were the two most prominent. You know, I actually kind of really dislike most YA covers but this one IS actually very pretty :) A shame the book wasn’t as pretty. I think this book is just average. I didn’t think it was that bad so check it out if you’re curious.